Computer Science for Fun - cs4fn: Bionic Body Parts: Science or Science Fiction? 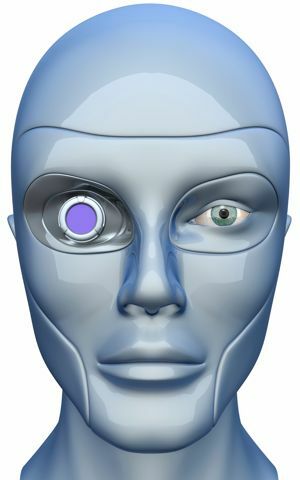 Bionic Body Parts: Science or Science Fiction? "Mad-eye" Moody lost his left eye and leg while fighting dark wizards. No problem replace them with magical body parts. The 6 million dollar man - an astronaut - lost his left eye (again) and this time both legs in a crash. The solution - create a man half human, half machine with super-human powers. It's all pure fiction of course ... or is it? Rahul Sugand of the City of London School investigates. Perhaps it's not completely fiction after all. German researchers recently created the world’s first electronic eye implant. It has allowed blind people to distinguish between every-day objects. Some patients have even been able to start reading again! The device is a retinal implant, only three millimetres in length, coated with approximately 1,500 light-sensitive sensors. Each sensor triggers an electronic pulse which travels via the optic nerve to the brain. This results in a simple black and white image, with a surprisingly high resolution. The potential for this machine is huge. It will be able to restore sufficient vision to people who suffer retinitis pigmentosa, an incurable genetic disease resulting in gradual, degenerating blindness in people of all ages. Once the implant has been perfected, it might even be available for the elderly population, who may suffer blindness due to age-related macular degeneration. It is the leading cause of impaired vision in people over the age of 50. It's not just the bionic eye that is now a reality, scientists from Israel and New Zealand have unveiled their versions of the bionic leg. It is a semi-robotic exoskeleton, truly crossing the boundaries of the Natural and the Mechanical. Using artificial intelligence, the right leg moves forward as the patient advances his left crutch, and vice-versa. It stems from the research of scientists at University College London only four years ago, motivated by paraplegics and amputees worldwide. Unfortunately, no-one is sure when these bionic extensions will be ready for wide-scale use, but this new range of robotic implants looks set to be the future of medical prosthetics. It would not be surprising to find, in only a few years time, doctors implanting the first bionic body parts in the UK, unless of course the NHS budget is cut further. It might even become the next must-have technology - especially if Apple buys the technology and so starts a new craze: the iEye.